This card would only ever get used if your opponent actually pulled off a Fusion Summon successfully at which point you'd take their Fusion by giving up one of your own monsters. So you're going to dedicate a spot in your deck against your opponent using up THREE cards to get out ONE Fusion Monster? Just no. 1/5 if I have to give the card a point, 0/5 if I don't. There's no point in using a card against a situation that will never occur. If you're at a big event and are paired againt Jaden Yuki then feel free to side this card in game two. This is one of two cards from the set designed to be really nasty to a fusion deck. I honestly don't feel that the cost should have been written in. The card is situational enough as is. -4 and you at a -1. Bottom line is that I like that the control switch is permanent, but I don't like the cost or the situationality of only being able to be activate in response to the fusion summon. I think Konami could have lightened up on one of those costs to give us a decent sidedeck option. As it is I think you should just stick with Non-Fusion Area. Well, things are finally settling down for ol’ Otaku. I still am behind (most of my writing would have occurred this weekend, but I was very busy during this time), so it looks like they’ll be mostly “quickies” this week. Wow. This is an easy one, even for me. 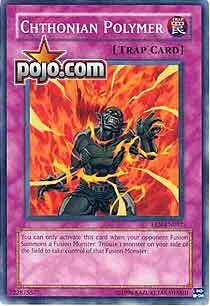 Most decks don’t use Fusions, and those that do will often use cards that just “Special Summon” (as in “doesn’t count as a Fusion Summon”) the Fusion Monster, meaning Chthonian Polymer won’t affect it. The only prayer this card has of ever seeing play is if, all of the sudden, Fusions that are properly Fusion Summoned become integral to all serious decks. Even in a casual format, countering just that one person’s Fusions is easier via other methods. This isn’t even a Quick-Play Spell, like De-Fusion, so you have to have it set ahead of time. Dark Paladin Today, we have a very interesting card, Chthonian Polymer. It's effect is VERY simple. You sacrifice one of your monsters to gain control of your opponent's Fusion Monster. The only problem is, you have to activate it when he/she summons the Fusion Monster. Okay, so I didn’t really like Branch! But this card sort of steps over the line with me. It’s a Trap so right away it’s slow and vulnerable to the usual stuff (Jinzo, end phase MST/Dust Torndao, Royal Decree, etc) Now it being a Trap means that it has to be good, the current trap line-ups are already really full, so there isn’t much room. But this card is situational and horrible. To start off it can only be activated when the opponent Fusion Summons, so it relies on the opponent’s actions, and otherwise is dead weight. Essentially this can really only be used against people running E-Heros. Not only is the activation timing bad, but you have to tribute a monster to then just gain control of the opponent’s monster. Meaning it’s an exchange of 1:2 leaving you at -1. I guess that’s sort of fair since the person you are playing just lost advantage to bring out their monster anyways, this card is sort of a little balancer in that way. Now this card would only have been a side deck against E-hero/VWXYZ card if it didn’t have that tribute and if those decks were actually any good. In the end, this card isn’t even worth running. There are probably only a handful of cards in this game that epitomize the word "useless;" this card happens to be one of them. First of all, hardly ANYONE plays Fusion monsters anymore. I've seen a few Cyber Steins thrown in here and there, but I've never seen a deck Top 8 in this format by playing Fusion Monsters. Maybe I'm not paying attention, but I'm just going by what I've seen. Second, as was already mentioned, this card almost defines situational. On the off chance that your opponent DOES Fusion Summon, you'll need this card on the field and a monster on your side of the field. If your opponent wants to risk a Fusion Summon, than they'd probably make sure they've cleared your field before they do so anyway, making this card worthless. notice how you haven't touched that card in the last 10 turns, and intentionally ignore it. That basicly means it's not even good MST/DTornado/Breaker bait. In an anti-Fusion deck, this thing reigns supreme. Right up there with De-Fusion and Cursed Seal of the Forbidden Spell. If you have any common sense, don't even touch this thing. Unless of course you intend to hurl it into the face of your opponant. In that case, props to you my good man. Erm...well...this works...if you need a REALLY retarded Ring of Destruction. I don't like it. You don't like it. Don't use it. Really, this is one of the worst Traps I have ever seen. zomgzorx! This is a game controller not without a cause, but in fact without a use. Seriously, this is one of the most situational cards in EE, the most being the VWXYZ never-gonna-summon. Sharing an effect with a card, then making it permanent , that sounds ok. Restricting it to fusions? Well that’s just silly. But this does go one step worse, the opponent has to FUSION summon the monster or this won’t work !!! You can’t even get their Cyber End !!! Ugh, nice are though. Traditional : 0.001 / 5. Obviously. Art : 4/5, I like it .